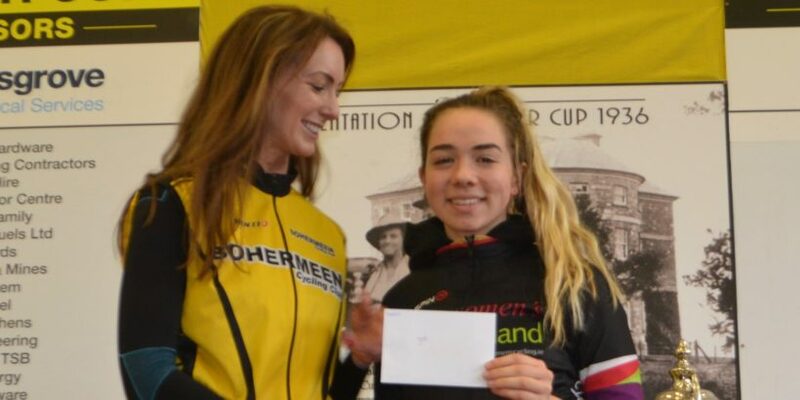 Sinead Molloy (Tullamore CC) led home a mass Bunch Sprint to win Round 4 of the Intermediate League in Bohermeen on Sunday (April 7th). Molloy outsprinted Claire Ní Reachtagain (Sundrive Track Team) and Elia Tutty (TC Racing) in a close and hard fought battle to the line. Yvonne Doran (Orwell Wheelers) looked to be finishing 4th, but she was caught on the line after a late charge by Ewa Kuras (Arcane Women’s Team). The big winner of the day was TC Racing Junior Elia Tutty. Elia went into the race as joint leader overall in the Intermediate league, but her performance has seen her take the leaders jersey, and go two points clear at the top of the league. “I knew this morning from looking at the sign on sheet that this race was going to be tough given that there was a large number of strong women on the start-sheet ahead of me. I was a bit nervous but excited to race as there was some big names there and it was my first time racing in Bohermeen. Eva Brennan (Deenside) pushed the pace from the start so it was very fast, soon it was controlled by experienced riders like Emma Walsh (Dungarvan CC) and Claire Ní Reachtagain (Sundrive TC). A few girls crashed in the 1st lap with about 5 coming down causing a split in the bunch, but it all came back together, with some top riders having to work hard to get back in contention.. There was a number of strong attacks on each lap from riders such as Niamh Stephens (TC Racing), Jenny Neenan (Sundrive Track Team and Ewa Kuras (Arcane Women’s Team). However none of them managed to stay away so it came down to a sprint into the last corner and up the hill at the finish. I liked the uphill finish and it suited my junior gearing! I was super happy to finish in 3rd just behind Claire Ní Reachtagain in 2nd and Sinead Molloy (Tullamore CC) in 1st place. I’m very grateful to be wearing the Women’s Commission Leaders jersey going into Round 5 (Deenside Cup). Big thanks goes to the Women’s Commission especially Roisin and Brendan for all their hard work in organising this League”.